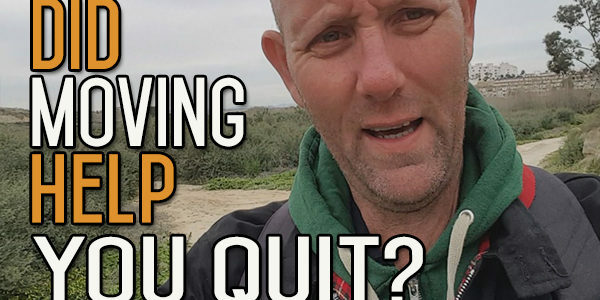 Do You Think Your Quit Alcohol Success Was down to New Beginnings? Today’s topic is from and mail that I got here the guy asked me, do I think my success was down to my new beginnings, in other words, moving to Spain, doing things like that in my life. The quick answer is that yes, most of my change is based on my new beginnings. But isn’t that what change is all about? Making new beginnings? How are you doing? I’m Kevin O’Hara for alcohol mastery (dot) com. Today’s topic is from and mail that I got here the guy asked me, do I think my success was down to my new beginnings, in other words, moving to Spain, doing things like that in my life. The quick answer is that yes, most of my change mostly the fact that I’m away from the booze now is based on my new beginnings. As I said, this guy is asking whether the change was because I moved to Spain, and was it because I got out of my old environment and stuff, if that was a big part of me being able to make the change. To be honest, I moved here a year before I stopped drinking, and the reason I moved here was because I wanted to…part of the reason was because there was cheap wine. I wanted to get the sun, I wanted o enjoy that life that so many people here come over here to enjoy which is to eat and drink and be merry in the sun. Also to work, I mean I had to work -self-employed and all that kind of stuff. But, eat, drink and be merry was a big motivation for me, in the sun. As it turned out, that was sort of the life that was going to send me down the spiral a lot quicker than I would have thought, than I would have done if I stayed in Ireland. Yes, that decision to move here and have new beginnings did have an impact on me, but it was sort of an off-shoot of an impact. It wasn’t a direct impact. The new beginnings that made such a big difference to me were because I stopped drinking. It was because I forced myself to do this and to get the alcohol out of my mouth. You have to do that first before you do anything else. You’ve got to stop putting the alcohol in. If you don’t stop putting the alcohol in, you’ve got no chance at all of making any new beginnings or making any progress in your life. Because, alcohol is such a hampering factor. Any progress you’re going to make with alcohol is in spite of it not because of it. When you stop drinking first, because alcohol is such a big part of your life, and I always talk about the behaviour of alcohol. You’re not just getting rid of the alcohol, you’ve got to get rid of the alcohol behaviour, of the alcohol thinking, of the habit which is all encompassing. It takes over so many different parts of your life. You’ve got the thinking about drinking, you’ve got the actual drinking, you’ve got the consequences of that drinking. That’s fundamentally taking over so much of your life. When you get rid of all that, when you take out the rituals, behaviour and thinking, and eventually you extract the habit and break it down. You’ve got a lot of different gaps that are left in your life, and it’s those gaps that you have to fill. It’s in those gaps that you have the best chance of having your new beginnings. That’s where all the new beginnings are. For me, I’m 50, that is such a wonderful thought, that you’re opening yourself up to opportunities to make so many radical improvements in your life; just bit by bit and taking a little bit out here and testing it out there and taking another bit out there. You’re taking something that has got such a massive grip on your life, and you’re taking that out, pulling it out by the roots. And all the gaps that are left after you’ve pulled this habit out, you’ve got to fill. And you’ve got the opportunity to fill it with something fantastic. Many of the new beginnings I had in my life started out because I took out the alcohol first and foremost, but I had to also get rid of a lot of the different parts of the behaviour. The friends that I had that I had to sort of stop seeing. It wasn’t a deliberate thing with most of these friends, you sort of drift away. You sort of realise that these people are going down a different path than you. When someone is going down a different path, eventually you can’t hear what they’re saying. What they’re saying is not going to interest you anymore so you just drift further and further away. There are so many other different behaviours that I’ve had to change; my eating behaviours, the ay I eat, the amount, the types of foods. That’s been a gradual process. All these things happen over time, they don’t happen on Day 1. They don’t happen after a month, they happen gradually. It’s a very dynamic process. It happens with trial and error, with making mistakes and picking yourself up and trying a different route and making mistakes there and more and more of that. So, when you look at it from that perspective, you realise that most of the changes that are going to happen in your life are always going to be up here in your thinking. That’s where everything has to happen first. You have to change your thinking before you can change your actions. Sometimes you’re forced into a series of actions that you have to take because of the circumstances you’re in, and that changes our thinking which therefore has a sort of rebooting effect on your further actions. But you rethink your drinking, you start to rethink the other parts of your life, like I said my exercise, my nutrition, all that kind of stuff. Eventually you start rethinking things about different parts of your life that you didn’t think you’d ever go down again. Like for me, going back to university was something. When I started this, it was not in the full front of my life at all. It was something I thought was well in my past. And, at the beginning of this, I’m sort of a couple of months into this now, and it’s taken me a while to get into my head and to really get back into studying, not that I was a great studier, but to learn something , learn some skills from studying that I could use myself. I sort of read a lot of books in the beginning and looked through a lot of videos and different study techniques and I tried a lot of different things and most of them didn’t work for me. I’m doing things that I’ve eventually developed. I’ developing a bit more style, and once I develop that, I’m sort of getting into it more and more. I’m sort of going off track here a little bit.. This is what this is all about, is taking a step by step approach to it the first time, breaking old habits that you don’t want and re-establishing habits that you might have had in the past or establishing new habits that you want in your life now. And it’s just doing that bit by bit basis. It’s taking your time doing it, and accepting that there is going to be a lot of new things in you life, and not fearing it. It’s grabbing the bull by the horns as they say, and just going for it. Sometimes that’s the best way to start, is to just get in there and play-act until you start feeling that you can do this. It’s a bit by bit thing. That’s the only way to do it going forward. Don’t think that you have to change everything. There are plenty of things in my life that I’m still doing now that I used to do before I drank. There were good things in my life that I had then. So it’s not everything that has to be changed. You might have to tweak a lot of things to fit in with your new life, but you don’t have to change a lot. A lot of changes are coming up in my own life that I’m looking forward to. I’m near the end of this 365-day challenge now and I’ve got another website planned, which is a lot similar to what I’m doing now. I’ll still be doing the alcohol mastery but maybe not every day. But I’m looking forward to new challenges, new things going forward and looking at what the next five or ten years are going to bring. I may not know the next direction I want to go, or what’s gonna happen. That’s the great thing about moving forward into new spaces in your life. You just don’t know what’s going to happen or where you’re going to be. But it’s all good, I’m looking forward to it. If you have any questions, leave them down below in the comments. Give us a like and share the video, it helps to grow the channel. Until next time, I’m Kevin O’Hara for alcohol mastery (dot) com. Maybe for some a new beginning is really just a new approach, or simply taking a good long look at yourself from a new perspective. I do think your move to Spain was helpful in that once you were separated from the pub routine and your regular drinking mates it gave you a better opportunity to get introspective and figure out your own long-term answers. When I began to seriously explore my own drinking habit and alcohol use in general, one question kept me motivated to give up the booze. I kept asking myself; “What would I be like if I had never ingested alcohol?” I wanted to know what it would feel like to be unaffected by alcohol (like when I was young) and face my daily life in a more natural condition. I honestly was not sure if I could even live without the crutch of alcohol holding me up, and I had to find out the answer. Turns out, I actually enjoy life much more without using the crutch. The happiness you may feel when inebriated is artificial and temporary. A natural, healthy lifestyle leaves you happy and content on a much more reliable basis without the negative physical effects of a hangover. I too love Spain and have traveled there numerous times. I will actually be in Madrid (airport) for a day in a couple weeks before leaving on a later flight to Toulouse and the start of another bicycling adventure in Southern France. Cycle touring is my addiction now and I crave it as much as I craved that first drink of booze after work every day!